Stephen George “Steve” Bull, MBE, was born on the 28 March 1965. The former English footballer is best remembered for his 13-year spell at Wolverhampton Wanderers. He played there from 1986 until his retirement in 1999, and holds the club’s goalscoring record with 306 goals, including 18 hat-tricks for the club. Yes, we all know what it’s like to have butterflies, the physical nervousness as we’re about to face a challenge. The easy way out is just is to give up! Now don’t get me wrong, I’m not telling you to give up! Giving up, or avoidance is actually the enemy of overcoming anxiety. It actually maintains the anxiety. I know that immediate relief does feel great and so the temptation to give up is great.But all that happens is the anxiety goes ‘below the radar’, eagerly awaiting another moment to resurface. And it does … at the next challenge you face. Social phobias, agoraphobia, to name but two are all the result of trying to avoid the butterflies of facing a challenge. Many people even convince themselves that the relief confirms that they weren’t meant to do ‘whatever’ in the first place. Wrong! 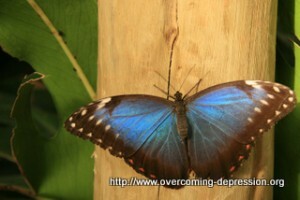 If you want to get over anxiety you have to live with the butterflies and face your fears and challenges. Do the very thing you don’t want to do, over and over again. That’s the way to get the butterflies to work for you! As I watch the London 2012 Olympics from the comfort of my couch, I ‘sit’ in awe of all the achievements of those amazing athletes. I’ve no doubt that their journeys to success was filled with many times of doubt and tears. But they persevered and succeeded. As Steve Bull says, ‘you have to get those butterflies to fly in formation! That’s the way to win! Next Next post: Make the most of the moment!